Many people regard California as a land of golden opportunity, where people go to make dreams come true in the fields of entertainment, technology, agriculture, and industry. 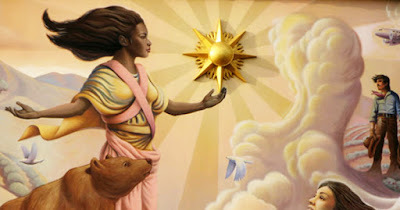 However, many Californians would probably be surprised to know that their home state is named after a strong and self-sufficient Black queen named Calafia (sometimes spelled Califia) who ruled over a golden island in Muslim mythology. There are many stories, from many different cultures, about isolated communities made up entirely of women who live in a matriarchal society and often banish or kill men who attempt to infiltrate their civilization. One such story in the Muslim tradition is about a legendary island inhabited by fantastic beasts and populated entirely by women. The ruler of this island is Queen Calafia, whose name derives from Khalif, an Arabic word for "ruler." A specific group of North African Muslims called Moors invaded Spain in 757 and ruled until 1492. They must have brought their legends with them because in the 1500's, a Spanish author named Montalvo published a romance novel which told a story about an island near Eden ruled by women who crafted tools and weapons of gold because there was no other metal available and fed men and boys to their hungry griffins. Spanish explorers were familiar with these stories, and when they discovered the Mexican peninsula of Baja California, they named it after the mythical island and its legendary Black queen.